Learn about the education of the children in the Outback during a visit to the School of the Air. Cruise the waters of Kakadu National Park where you are sure to see the fearsome saltwater crocodile and plentiful bird life. See a Tasmanian Devil during a visit to the Tasmanian Devil Conservation Park and learn about the efforts to save these great creatures. Visit Te Puia, the premier geothermal experience in New Zealand’s Maori cultural capital, Rotorua. Relax and refresh before your flight to Australia. Soak in the sunshine and breathe in the tropical air. Explore the coastal city that has stunning views and a cosmopolitan feel. Relax and refresh before your flight home. Your tour opens in Cairns, the tropical gateway to one of the world’s most spectacular natural attractions and a World Heritage site, the Great Barrier Reef. Established as a marine park in 1975, the reef is a haven for thousands of species of sea life, as well as turtles and birds. Board the Skyrail Rainforest Cableway for an unforgettable morning ride over the rainforest canopy. Embrace the opportunity to explore the forest floor up-close with access to specially designed boardwalks. Your evening is at leisure to enjoy your tropical surroundings. Access the history and culture of the Aboriginal people during a "Dreamtime Tour” where your specialist guide shares stories of creation and everyday Aboriginal life. You’ll even taste native cuisine. Later, board your flight to the city of Darwin on the northern edge of Australia and drive into the heart of Kakadu National Park. Enjoy a city tour featuring Fitzroy Gardens, the Shrine of Remembrance and bustling Victoria Markets. Take some time at leisure to explore Melbourne independently. Later, travel to Phillip Island, a renowned nature reserve and home of the world’s largest colony of Little Penguins. Protected and studied by rangers, hundreds of them waddle out of the sea and cross the beach to their burrows in the dunes. At the interpretation you have a chance to learn about the life of the Little Penguins and their significance to the region before enjoying access to the exclusive Penguins Plus viewing area. A flight to Hobart, Tasmania brings you to Australia's second-oldest city. The rugged and pristine beauty of the island of Tasmania provides the backdrop to your two-night stay. This morning brace yourself as you meet the Tasmanian Devil at the Tasmanian Devil Conservation ! Learn about this unique marsupial, its fight for survival, and the efforts in place to save it from extinction. Later, take a guided tour of the Port Arthur Historic Site, the best-preserved example of Australia’s original penal colonies and home to stabilized ruins and restored buildings dating back to 1833. En route, witness the spectacular coastal rock formations known as Tasman Arch, Devil’s Kitchen and the Blow Hole. 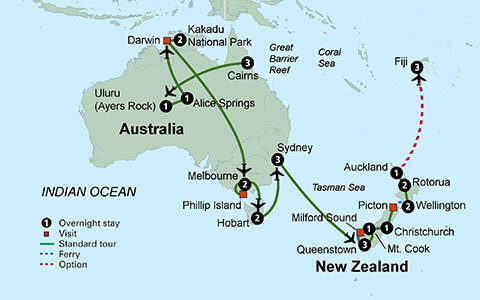 Leave Australia behind and fly to one of the world’s best-kept secrets - New Zealand! Arrive in gorgeous Queenstown. This evening, enjoy dinner at the Skyline Restaurant where you will enjoy spectacular views overlooking Queenstown, the Remarkable Mountains and mysterious Lake Wakatipu. En route to Milford Sound, enjoy the rugged grandeur of the Hollyford Valley. You’ll travel through ancient beech forest via the Homer Tunnel. During a cruise of the breathtakingly beautiful Milford Sound, you’ll see why this fjord is one of the most visited sights on the South Island. With rock faces that rise nearly 4,000 feet on either side, the scenery will take your breath away. Following your cruise you return to Queenstown. You may choose to return via a short optional flight (weather permitting) for spectacular views of New Zealand’s Southern Alps. Queenstown offers limitless diversions set amidst breathtaking Alpine scenery. Shop in the charming village or enjoy an optional and exhilarating jet boat ride on the Shotover River. Or, perhaps you will join the optional "Journey through Middle Earth" tour which takes you through the majestic Remarkable Mountains and the breathtaking Queenstown countryside showcasing many of the spots where the Lord of the Rings movies were filmed. On your journey to Picton, admire the coastal views, scenic river valleys and vineyards. From there, sail across Cook Strait to experience what has been called “the most beautiful ferry ride in the world.” Your final destination is Wellington, New Zealand's capital city. During your panoramic sightseeing tour of Wellington, view the Beehive, New Zealand’s Parliament; historic St. Paul’s Church; and the Old Government Building - the largest wooden building in the Southern Hemisphere. Following the tour, visit the National Museum of New Zealand, Te Papa Tongawera, a fascinating dedicated to art, history and the Maori culture. This morning visit Te Puia, New Zealand's premier Maori cultural and geothermal experience. Witness how the Maori keep their culture alive by teaching the tribal youth traditional carving and weaving. Enjoy the chance to view the Kiwi bird and learn what is being done in an effort to remove this marvellous creature from the endangered species list. Next, meet the skilled carvers who work with pounamu, New Zealand greenstone, at a local jade factory. Then, visit the Agrodome where you will see a sheep shearing demonstration and learn about the importance of agriculture to the nation. Travel through the majestic countryside of the North Island, arriving in New Zealand's largest city, Auckland, "The City of Sails." A panoramic city tour features the America’s Cup Village, the War Memorial, vibrant Queen Street, the Auckland Harbour Bridge and spectacular views from the harbourside. Join your fellow travellers this evening at a local restaurant for a farewell dinner where you will toast the end of a wonderful trip! Your tour ends in Auckland. New Zealand is 16 hours ahead; Cairns is 14 hours ahead; Melbourne and Sydney are 15 hours ahead; Alice Springs/Ayers Rock are 14.5 hours ahead of EST. The highest point on this tour is 2,500 feet above sea level. The currency in Australia is the Australian Dollar, and in New Zealand, it is the New Zealand Dollar. Australia and New Zealand use 230 Volts. Both are Type I plugs. Based on Eastern Standard Time: New Zealand is 16 hours ahead; Cairns is 14 hours ahead; Melbourne and Sydney are 15 hours ahead; Alice Springs/Ayers Rock are 14.5 hours ahead. Australia is the lowest continent in the world with an average elevation of only 330 meters (1,082 ft). In New Zealand the highest elevation is Mt. Cook at 3,754 meters (12,316 ft) above sea level. The highest point on this tour is approx. 2,500 ft.